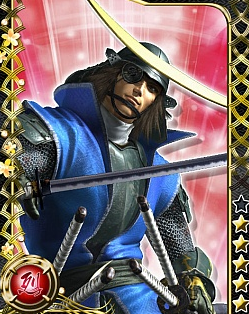 The Sengoku Basara anime movie blog made one of its rare posts this week to announce a brand new tie-in. This one is pretty interesting even though it's got nothing to do with the games. Last summer, the anime's character designer Ookubo Tooru travelled up to Ishinomaki to draw a new tie-in illustration for the famous Sendai Tanabata festival. This has happened a few times before for special occasions since the Sengoku Basara characters have been used to promote tourism frequently across the country. In this case, the picture was eventually revealed to be of the San Juan Bautista (Datemaru), a famous ship made by the real-life Date Masamune which travelled all the way to Europe on a diplomatic mission. That mission is celebrating its 400-year anniversary in 2013 and it's been in the news on a regular basis, both in parts of continental Europe and in Japan. What makes this particular tie-in especially lovely is that the replica San Juan Bautista and its museum are situated in Ishinomaki, a region that was hit very hard by the terrible Touhoku earthquake and tsunami almost exactly two years ago. It celebrates one of the positive aspects of the Touhoku region at a tough time. 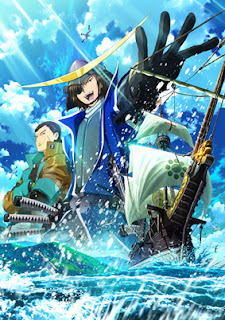 And Masamune/Kojuurou look cool with the boat. 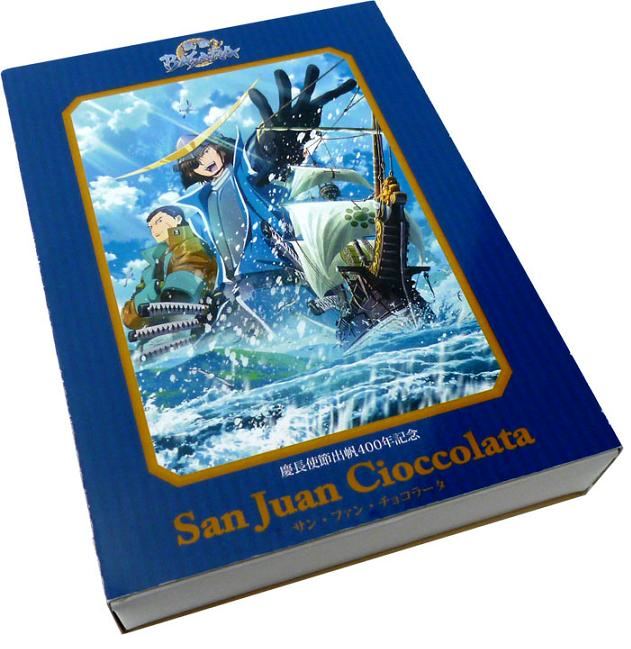 Today's tie-in brings the illustration of the San Juan Bautista back again, using it for a special regional omiyage item. The approach of White Day in Japan has brought with it these 'San Juan Cioccolata'. The chocolates are manufactured locally in Ishinomaki and they'll be sold in the Ishinomori Mangakan (Ishinomori Shoutarou Manga Museum) for 840yen per pack starting on 23rd March 2013. Those who can't travel up to Ishinomaki can also buy the chocolates in Odaiba at next week's Tokyo International Anime Fair 2013 while stocks last. Production I.G. is running a booth as part of a clump of exhibits called the 'Anime & Character Rettou (Islands) JAPAN' on the public days of the fair on 23rd and 24th of March 2013. 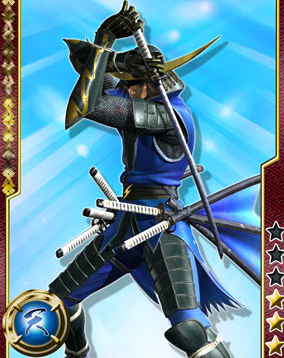 Their booth seems to be themed around characters which represent Japanese regions, so of course they've selected Date Masamune from the anime adaptation of Sengoku Basara to represent Miyagi Prefecture. On the game side, the biggest news has been that Capcom has started accepting registration for its new My Capcom community, which is going to coordinate things like the official mobile newsletter (Tokusei Kawaraban) from now on. They've added a lot of incentives to join up including prize draws where you can win all kinds of crazy things, including your very own replica Date Masamune helmet. Only one lucky person will be selected to win the kabuto, but another five hundred fans will win a rubber 'pixel art' strap. I love how many freebies you can get every time you do anything in Japan.